Feel comfortable in your own skin this summer! Summer is on its way and us Albertan's could not be more excited! 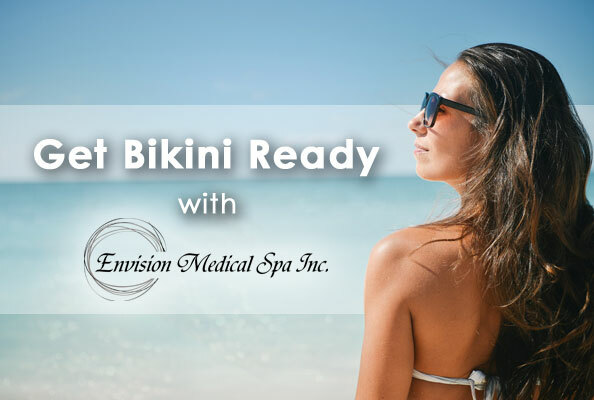 Here are some great options to help you feel bikini body ready! Who Wants Unwanted hair & veins? Nobody likes unwanted body hair, especially in the summer! The Syneron GentleMax Pro has the latest laser hair removal technology that works to help pigmented and vascular lesions as well. Your skin will be hairless, smooth and vein free. The GentleMax Pro is the fastest and most powerful dual wavelength hair removal laser on the market with safety and patient satisfaction! We also offer spa packages for waxing underarms and bikini areas as well as zapping your upper lip hair away. Count on Envisions certified therapists to deliver a long-lasting solution for ridding your face and unwanted hair, safely and comfortably. Are you going through the bikini body blues? We can help! Here are two of our most popular treatments - CoolSculpting & Clean Start Weight Loss. CoolSculpting offers a natural way to lose fat in a non-invasive manner, with minimal discomfort! This FDA approved procedure targets areas of your body that resist dieting and exhausting exercise, all while helping you gain your confidence back! To see an exclusive CoolSculpting video starring Brenda & Judi click here. Clean Start Weight Loss was designed to eliminate your body's fat deposits by combining medical supervision, weight loss injections, calorie reduction and supplements to induce weight loss. Patients who stick with the program lose weight faster and experience better results! The results for both of these treatments are proven, noticeable, and long lasting - so you'll look great from every angle this summer! The last thing you want to worry about this summer is acne marks, discoloration or other blemishes. We offer four proven to work acne fighting solutions that will help you look like you best self! Chemical Peels help you remove the upper layers of your damaged skin allowing new epidermal layers to flourish. This treatment reduces the appearance of acne, blemishes and scars, leaving your skin feeling soft. Microneedling is a procedure that penetrates the epidermis with tiny needles that allows your body to create new collagen and elastin, leaving your skin tight and acne free. Blue-light Therapy is a non-invasive acne treatment proven to kill acne bacteria with no drugs, lasers or pain! This therapy can be used on any part of the body and is safe for teens and adults. Dermafrac is an intensive anti-acne therapy that combines four proven acne treatments - microdermabrasion, midcroneedling, product infusion and blue-light therapy. You get the benefits from all of these therapies in one treatment! To learn what treatment would work best for you, book your FREE consultation with us! Call 780-986-8352 today!